SKU: LL-A. Categories: Exterior Finishes, Interior Finishes, Perma-Chink. Tag: Lifeline Accent Exterior. Lifeline Accents is Perma-Chink System’s newest exterior/interior, two-coat color finish developed to provide customers with exciting new colors and style. Draw attention to a particular area of your home by using the rich, transparent, Lifeline Accent pigments for your wood trim, interior and exterior walls, fascia, millwork, timber, furniture and other wood elements of your home. 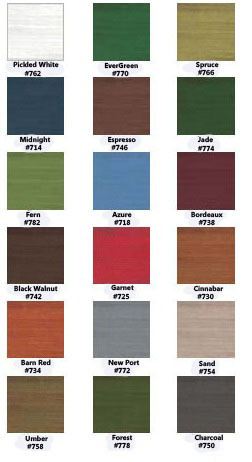 Uses: Accent color on interior and exterior trim, walls, fascia, mill work, timber, furniture and other wood elements of your home. Apply finishes in thin layers. If it runs down the wall, you are applying too much. OBSERVE CORRECT COVERAGE RATES as listed on label. Check for deterioration and decay. Remove and replace or repair deteriorated wood. Unsound wood should be repaired prior to applying Lifeline Accents. Contact LogFinish.com for information about wood repairs. Note for log siding and milled logs: Milled logs and log siding may be milled to a very smooth finish. If so, it often has mill glaze on the surface. If mill glaze is not removed, your exterior stain will not adhere properly to the surface. Mill glaze can be removed by using X-180 Weathered Wood Restorer according to the label instructions. All surfaces should be free from mill glaze and contaminates including dirt, dust, mold and mildew, old finishes, water repellents and wax. Use appropriate products to remove existing finishes and/or to clean and prepare surfaces. If a borate preservative has been previously applied, make sure it is completely dry before applying Lifeline Accents. If the surface is tacky or there are visible deposits on the wood, wash the surface with water and allow it to dry. Do not use Lifeline Accents on surfaces that have been brushed or rubbed with steel wool. If you do, rust spots may appear under the finish. If more than a week has passed since the surface has been stripped or cleaned, wash down the logs with Log Wash™ , rinse well and allow the surface to dry before applying Lifeline Accents. If the surface has been media blasted or if the wood is rough and/or porous, apply a coat of Prelude™ Clear Wood Primer prior to the Lifeline Accents This will ensure proper color generation and add an extra measure of protection to the wood. If multiple containers are used on the job, they should be mixed together to ensure color consistency. Wear rubber gloves to avoid stains to the skin and fingernails. Stir thoroughly before and regularly during use. Lifeline Accents can be applied with a brush or airless sprayer. Do not apply to hot surfaces or in direct sunlight. Do not apply when the surface temperature is below 40° F or above 90° F.
Lifeline Accents should always be applied in thin coats. Wait for the first coat to dry (at least two hours depending on temperature and humidity) then apply a second coat. Always back brush to ensure even coverage and to avoid visible drips and runs. For exterior use: once Lifeline Accents has dried and you are satisfied with the appearance, apply one or two coats of Lifeline Advance Gloss or Satin clear topcoat. For interior use: once Lifeline Accents has dried and you are satisfied with the appearance, apply one or two coats of Lifeline Acrylic Satin/Gloss top coat. Topcoats enhance the beauty of the finish and play a significant role in protecting the wood against water, mold, and UV light, thus extending the life of the stain. Follow all application directions when applying either top coat. Clean area and equipment immediately with warm, soapy water. For sprayers and other commercial equipment, follow the manufacturer’s directions. For removing Lifeline Accents that has dried, soften with alcohol or mineral spirits and then clean with warm water. Please do not pollute our environment. Dispose of containers and unused material in accordance with local, state and federal regulations. Periodic cleaning with an appropriate cleaner such as Log Wash™ helps extend the life of the finish and accentuates the beauty of your home. We recommend that log walls be washed down at least twice a year. Wood checking, cracking and shrinkage may eventually expose unprotected wood. Apply periodic maintenance coats as needed paying special attention to the South and West sides of the home as they may have greater exposure to the elements. Store Lifeline Accents out of direct sunlight and protect from freezing. Although Lifeline Accents is freeze-thaw stable, if the product is accidentally frozen, allow it to thaw, mix well and check for suitability of use before applying. com ships 99% of all orders within 24 hours of receipt from our warehouse in Western NC.